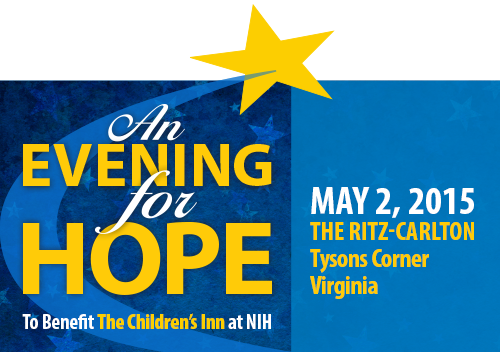 The Children’s Inn at NIH, a nonprofit, “Place Like Home” for families with seriously ill children who are in treatment at the National Institutes of Health (NIH), raised nearly $700,000 at its gala fundraiser, “An Evening for Hope,” on Saturday, May 2nd. Seven hundred and eighty donors gathered at the Ritz-Carlton in Tyson’s Corner to contribute their financial support towards making a difference in the lives of seriously ill children and their families. The Capitol Steps, a musical comedy group, capped off the evening with song parodies and timely political commentary. Jamie Gentille, a young woman who contracted HIV during open-heart surgery as a child and was successfully treated at the NIH spoke to the audience about what a difference it made for her to stay at The Children’s Inn while she participated in one of the first drug protocols for pediatric HIV. Now in her 30’s and married, she is the author of the book, “Surviving HIV, Growing Up a Secret and Being Positive.” She described her journey through a time when HIV and AIDS was a highly stigmatized terminal disease, to the hope she found from the medical advances, to a full life of near normalcy. Other current and former residents and their families also described how the existence of The Inn alleviated many of the stresses of dealing with a serious illness. The evening brought together a range of health industry supporters who are helping to push the boundaries of medical discoveries at the NIH, the nation’s premier biomedical research center. EagleBank, Microsoft, Sapient, Northrop Grumman, PricewaterhouseCoopers, Westat, NETE, Maximus, GDIT, NCC, ICF International, Rob and Ruth Guerra, and ASM Research. The Children’s Inn at NIH is a nonprofit, residential “place like home” for seriously ill children and their families while they are participating in groundbreaking medical research at the National Institutes of Health, the world’s leading biomedical research center. Families come from across the country and around the world to stay together at The Inn – free of charge – no matter how long they need to stay. The Inn gives kids a chance to be kids and aims to reduce the burdens of illness through recreational, therapeutic and educational programming.